← Camino Frances: The Journey Begins! This is unbelieveable! We are pinching ourselves because we will be sleeping tonight on the flanks of the Pyrenees Mountains in Orisson. Orisson is in France, but tomorow we will finish crossing the Pyrenees and arrive in Spain. We wonder what the border crossing will be like. Will there be a “Check-point Charlie” of some sort and will we have to produce our Canadian passports? We arrived at the Refuge Orisson, got cleaned up, and relaxed for most of the afternoon in our private room. This auberge is supposed to have 18 beds in three dormitories. Just before we arrived, we wondered whether men and women have different dorms and we decided that, if we were in the same room, Dave would take the lower bunk. We reminded ourselves to make sure to choose beds as far away from the bathroom as possible. A banging bathroom door can be a sleep disturber, to say the least. Somehow we lucked out and have a twin-bedded room all to ourselves. So, for 35 Euros each we have probably got the best room in the house, dinner, and breakfast, and the bathroom door is nowhere in sight. When we checked in we were given two tokens for the showers. Each token was good for a five-minute shower. Since we had worked up quite a sweat on the hike up from St. Jean Pied de Port, I went straight to the shower. I inserted my token and muttered an expletive when the water that rained down was icey cold. It warmed up somewhat, but the spray became a trickle and then stopped. I soon learned that you need to pump the tap to get more water. The procedure is repeated until five minutes is up. I got clean. Dave unfortunately was not so lucky. When the spray became a trickle and stopped, he spent time lathering up, saving his water for later. Big mistake! You have five minutes to use the shower and, if you don’t use the water, you are out of luck. You can’t save it for later. Anyway, he ended up using his big microfibre towel to wipe as much of the soap off his body as possible. We will be curious to see what happens if it is raining tomorrow. Will he get sudsy? 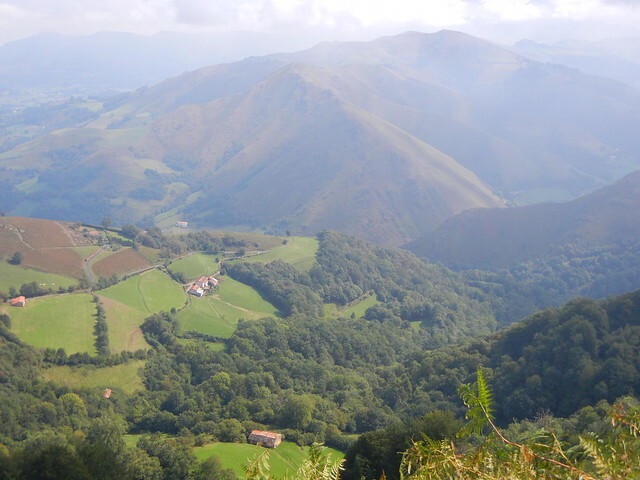 It sure was an arduous hike up from St. Jean Pied de Port, but all the way we were rewarded with stunning views in all directions. It was steeper than any of the training hikes we did in Dean Park, where we averaged five kilometers per hour. It took us four hours to go eight kilometers which is very slow for us, but the scenery was gorgeous and so we stopped often to take pictures, meet people, and simply enjoy ourselves. I couldn’t help but laugh when I saw a pair of ladies undies displayed on a barbed wire fence. Maybe they had been lost by some poor pilgrim who might be down to her last pair. Note to self: Use two safety pins when hanging damp laundry outside my pack! We definitely were not alone on this hike. There was a big tour group leaving St. Jean Pied de Port at the same time we were. They were carrying day packs and probably much of their gear was being transported for them. We also met another couple (whose names we failed to get) who originally came from Australia. I admired all her bracelets, each one having a significant meaning. She also has prayer beads around her wrist for Buddhist meditation. A little angel doll which had been made by her mother many years ago was snapped to her waistband. 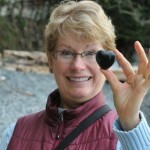 Her mother had “passed over to the other side” about fifteen years ago and she has some of her mother’s ashes with her. This reminds me of Tom in the movie, “The Way,” who sprinkled his son’s ashes along the Camino. If I sound at all high, it’s because I am! It is true that my new German friend kept topping up my wine glass, but I’m not high just because of that. One hundred people just finished singing “Happy Birthday” to me with such gusto and with so many foreign accents, it absolutely made my day and my year and all my future years rolled into one very special evening. It meant far more than any material gift ever could. When dinner was over, we all were invited to stand up and introduce ourselves, saying where we come from and what our goal is. When it was my turn I introduced myself as “the birthday girl” Judy from the western side of Canada. 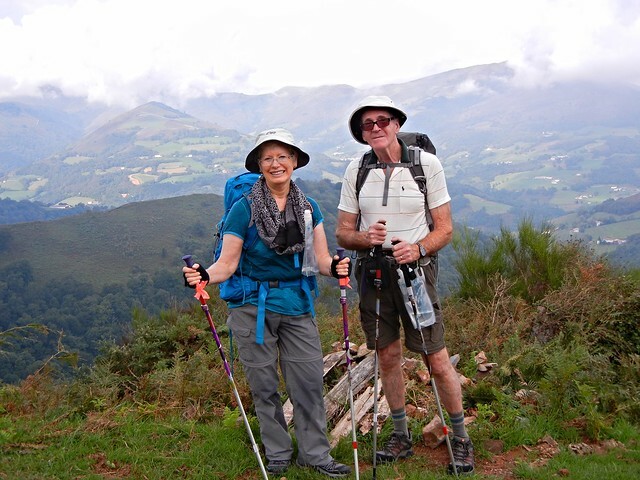 I said I am walking with my husband Dave and that our goal is to reach Roncesvalles tomorrow and with any sort of luck we’ll reach Santiago in many weeks. Dave introduced himself and said the reason we are walking has a lot to do with our daughter’s encouragement and explained that Tania had walked the Camino two years ago. He then asked if there was anyone else from British Columbia in the room. Although there were many Canadians from Ontario here, no one was from British Columbia. Dave expressed how happy he was to be doing this. While he still had the floor, I piped up, “It took a lot of arm-twisting in the beginning!” Then Dave admitted that he considered renting a Smart Car and transporting our luggage and not walking at all. Everyone laughed. Actually, there was a whole lot of laughter and cameraderie that evening. We can hardly wait to find out what tomorrow brings. Today is one of those days that will always be treasured. 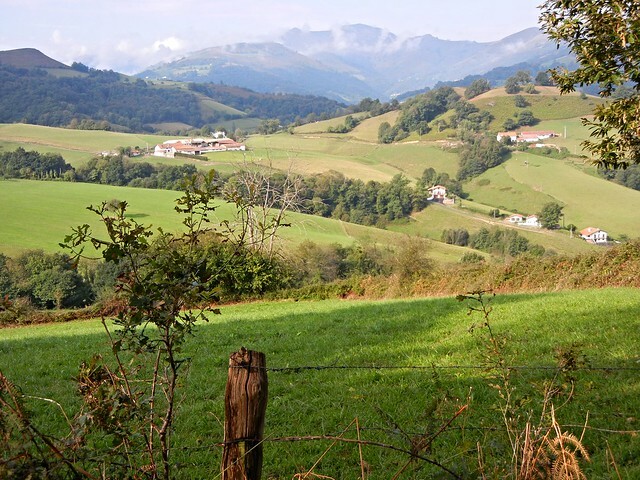 This entry was posted in Camino de Santiago, Travel and tagged Camino, Camino de Santiago, St. Jean Pied de Port. Bookmark the permalink. This is wonderful! I am so happy to hear of all the camaraderie already! It’s just the beginning of such a beautiful journey. You and dad look so happy in the mountains. The pictures are amazing! Love the one of the horse especially! Sounds like a birthday to remember Judy. Dave, I had to laugh about the water and soap story. Caught in the rain, you would have been one big bubble! Thank heavens it was sunny and the only bubbles were in his cerveza! I’m glad to have you following the journey. 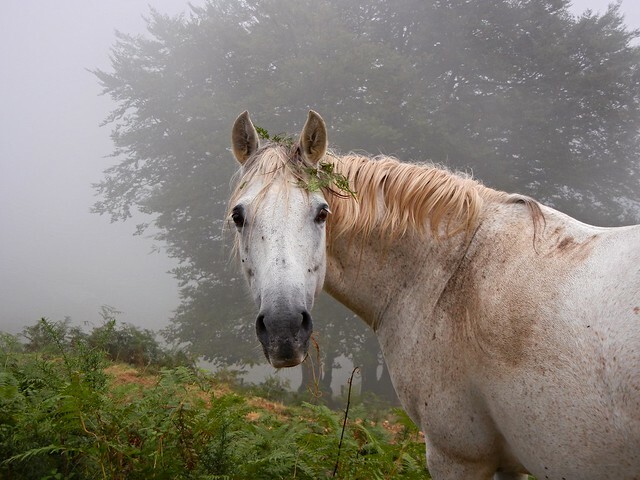 The Camino and the lovely people you meet along the way are a treasure!